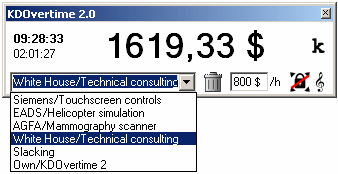 Define as many projects as you want, along with different hourly rates (optional) in whatever currency you like. See the project time and total time (that usually flies by like fffffft) spent today along with the money earned (which usually is a good motivation). If you do not specify an hourly rate, you just see the time ticking by. BIG TIME. If you do not specify a currency, KDOvertime uses your default. You can also define any currency you want. KDOvertime plays cool music (default is >We vs Death: Wake 44< and >Troublemakers: Get Misunderstood<) to remind you you're still in pause mode (optional). Of course you can define your own music directory, and you can turn off the music. KDOvertime can also lock the screen during pause mode, so that you do not forget to resume when returning to your work. ...but the blinking may be enough already. ...so that you can get to your work right through it. 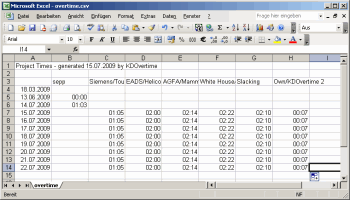 KDOvertime keeps a list of your project times for every day it's being used, along with total times, exported as text and excel file. Buy here. 7 EUR Special Price! You can also buy it via share-it. Download here. Runs from the USB stick, too!